The Milton Community Food Pantry, located at Parkway UMC, supports Milton individuals and families in need. Visit the Pantry's website and/or call for more information at 617-696-0221 . Volunteers Needed: Adult and student volunteers are needed to assist clients, stock shelves, carry groceries, and date-check donations from 8:30am to 11:15am on Saturday mornings. High School Students who need Community Service Hours are welcome! Please contact volunteer coordinator Michael Theobald at 617-696-1497 to sign up. 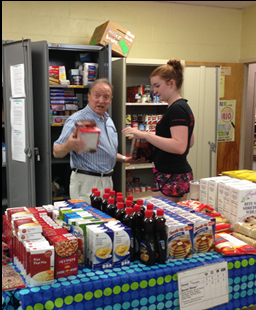 Food Donations: The Pantry accepts food donations on Saturday mornings from 8:30am to 10:30am. No donations after 10:30am. If you have held a food drive, and have a large donation that needs to be dropped off, please contact us at 617-696-0221 to arrange a time. Financial Support: Financial support from individuals, area businesses, and foundations is appreciated. Checks should be made out to the Milton Community Food Pantry and mailed to: The Milton Community Food Pantry, c/o Parkway Methodist Church, 158 Blue Hills Parkway, Milton, MA 02186.